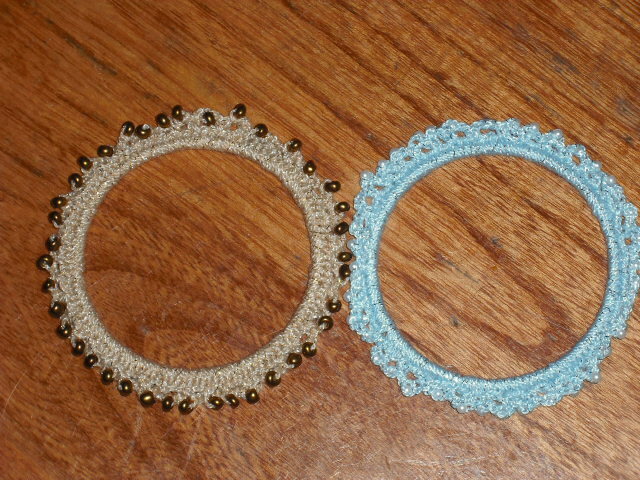 I have 7 of 16 rounds done on my doily. So far so good. I was counting down the minutes this morning and even had my husband texting me updates as to when I could start crocheting. Of course, you know that means I didn't pick up my hook all day! Instead I spent it chasing my babies and then my friend's kids that I watch AND making delicious cake Batter fudge and vanilla cake for my toddler's 2nd birthday party tomorrow. I figure that baking was a pretty good reason to not crochet today. Also, someone tell her to stop getting so big so fast! sounds yummy can you share the recipe? crabby rat- Can't wait to see the pics..And I'm also going to weave ends in as I go..My "goal" is to do 20 rounds per day..I'm already 1 day behind, so now I'm hoping to get at least 5 rows in today..I'm on my 2nd row for the day (row 6) and I just noticed it's time to start dinner..I just looked at the clock not too long ago and it was 2:30pm...Where has the time gone..
GO GO GO GO GOOOOOOOOOOOOOOOOOOOOOOOOOOOOOOOOOOOOOOOOOOOOOOOOO CROCHETER'S!!!!!!!!!!!!!!!!!!!!!!!!!!!!!!!!!!!!!!!!!!!!!!!!!!!!!!!!!!!!!!!!!!! I have the body of the coat finished. There were some challenging issues with the directions, but I think they are resolved. The shoulders still need to be sewn together, but now that I figured out where they belong and they are on correctly that shouldn't be an issue. I need to resolve how to approach the arms and handle the trim. The pockets don't look like they'll be too hard to make and sew on. Then of course the buttons. I really am not looking forward to the buttons. I spent time today working on the matching hat and taking a break from the coat while watching some of the events on TV. I also dug out a muff pattern that will be really cute with the outfit. I finished the second row of bricks today! I have figured that I need to complete 1 row of bricks each day plus one more in order to complete this throw on time. Seems do-able so far! Glad to see others are getting stuff started and worked on! 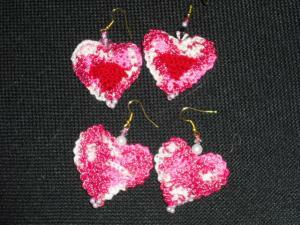 Go Crochet! keep it up ladies! I really enjoy hearing about your projects! I'm back from work now so we'll see if I can't break into that second slipper.... Might not happen tonight and I won't have time tomorrow. I'm off to bed...(8:48 here) I will start row 8 in the morning..Now that I'm getting the hang of it, it'll go quicker I hope...If not I'll do a bronze or honorable mention...And I have about 6 more graphghans I need (want) to do before Christmas...HA HA HA HA HA.....I didn't think I would like the afghan too much, since it's bumpy...BUT I'm really starting to like it because the picture is the same on both sides...So THAT in itself is a confidence booster.......Night all..And HAPPY CROCHETING!!!!!!!!!!!!!!!!!!!!!! I have to frog the last round I did... I let the Darktatortot play on my computer and didn't want to bother him to look at the photo (which is enlarged to show detail on my screen) so I went by the pattern only... oops! LOL Luckily, it's just a round of chain loops so it shouldn't take too long to re-do. The point is - I"m not registered athlete... I had problems with the internet on Thursday and Friday and didn't manage to register. Anyway, I'm going to complete the dress during The Games and I hope to work on another dress too. I got the shoulders sewn together for the doll coat and all the loose ends to date are tucked in. I'm trying to finish up another project while I work on this one, so I will get back to this again tomorrow. Well, I realized I made a mistake on my throw...at the beginning and all the way through!!! I frogged the whole thing this morning. Now to play catch-up! Sorry it's taken me so long to get the recipe to you guys. This stuff tastes amazing. My DH just told me that he's not sure I'm going to get any of it because he's sure he's going to eat it all. As for crocheting, with how busy I was this weekend and getting even MORE sick, I haven't picked up a hook all weekend so I've got some work ahead of me. On the plus side, I did find another ball of white that I didn't realize I had and rerolled it into a center pull ball so it'll be easier to work. 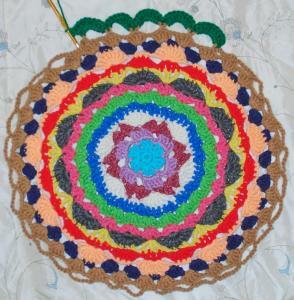 I figure I have till Tuesday next week to get the throw done and then a day or two to crochet the flowers and the branch and then sewing them all on. Good thing those ends are going to be able to be used to sew those flowers on so I won't actually have to REALLY deal with them! Cake Batter Fudge Ingredients 1 cup yellow cake mix 1 cup confectioners’ sugar 1/2 stick (1/4 cup) butter, cut into small squares 1/4 cup milk sprinkles Instructions Mix cake mix and icing sugar in microwave-safe bowl. Add butter and milk. Don’t stir. Microwave for 2 minutes. Stir immediately until completely combined. Add sprinkles. Do not overmix as sprinkle colour may bleed. Spread into greased pan. Refrigerate for at least one hour. I'm pretty sure I upped the cake mix and the sugar to two cups and left the rest the same. I know that I ended up using the entire Giant brand $1 yellow cake mix bag, so however much is in a premade mix, is how much I used and matched the measurement with the sugar. Well... I haven't done any hooking today (yet) so I'm heading over to my corner now to and I should make it through at least one round ~ hopefully more ... it is somewhat late, though, so I'm not sure how many I'll actually knock out. I did get my notes for what goes where jotted down, so at least that part's done! I can't wait to see of your work!! well, now I know why i have tension issues- steel hooks have a very wide range of thicknesses after the hook !! so far I am happy with the results, but I have much more respect for prople wo do really fancy stuff with thread!!!! I cannot connect to crochetville from home. Not sure how to fix that. Thank goodness for Barnes and Noble! 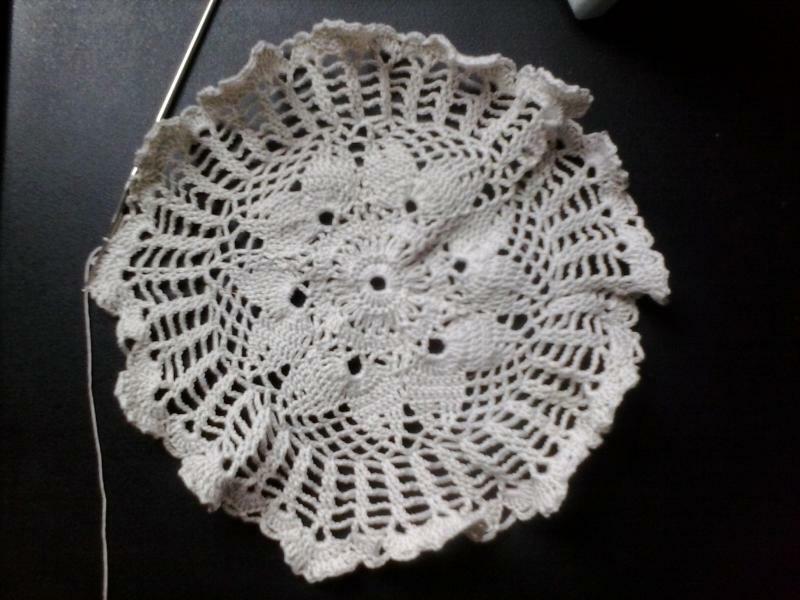 Anyway, I finished the doily. It is very wonky and in need of blocking. I will get it blocked and go for the gold asap ! I LOVE those bracelets! I've been meaning to make some like that myself but never get around to it. I really ought to do it some time, they are lovely! So I went to Michael's to pick up a new M hook since my toddler made off with my N (it was my backup...) and lo and behold, I don't think my Michael's likes us crocheters! About 3/4ths of all of the hooks were out of stock but every single size knitting needle was there. I was even willing to buy a pack of hooks if it had an M in it! Nope. Nope and more nope. So I decided to change the stitch and got a L afghan hook with the long wire bit so it'll work. Of course, that meant I had to pick up two more things of white caron one pounds so I'd have enough yarn. Well... there went my stash busting score for the week! Now time to find a tunisian stitch that I like that will be kind of quick. I started off feeling ok; got most of one booster rocket done over the weekend. I've been able to work on it during the day because the parts still don't look like anything yet, and he can't read yet so he doesn't know what the pattern says. I wanted to start work on the orbiter next because that's the part I really want to make sure I finish. Restarted it four times last night because I kept getting the counts wrong and could barely make out the stupid black stitches. And today I realised that my black and white yarns are two different sizes, and TOO different at that, so I'm going to have to restart the orbiter after a yarn shopping trip. Working on the other booster rocket tonight so at least the time isn't going to waste! Can't wait to start seeing more pictures! I don't get much at Michael's. I am a Bates person and they only sell Boye so that doesn't help me. I have discovered recently I like their brand of worsted though. I've bought a couple of skeins of the white for various projects and I liked it. I finished up one of my big balls and went back recently and got another one when it was on sale. I haven't picked up a crochet hook since Monday, as I'm dealing with the flu. Thankfully the body of the coat is finished. I need to do the arms, the trim, and the buttons. So hopefully, in another day or so when my body is feeling human again I can get back to that. As for the Olympics blanket, I finally have a few rows done! Yay! I finished blocking my doily. 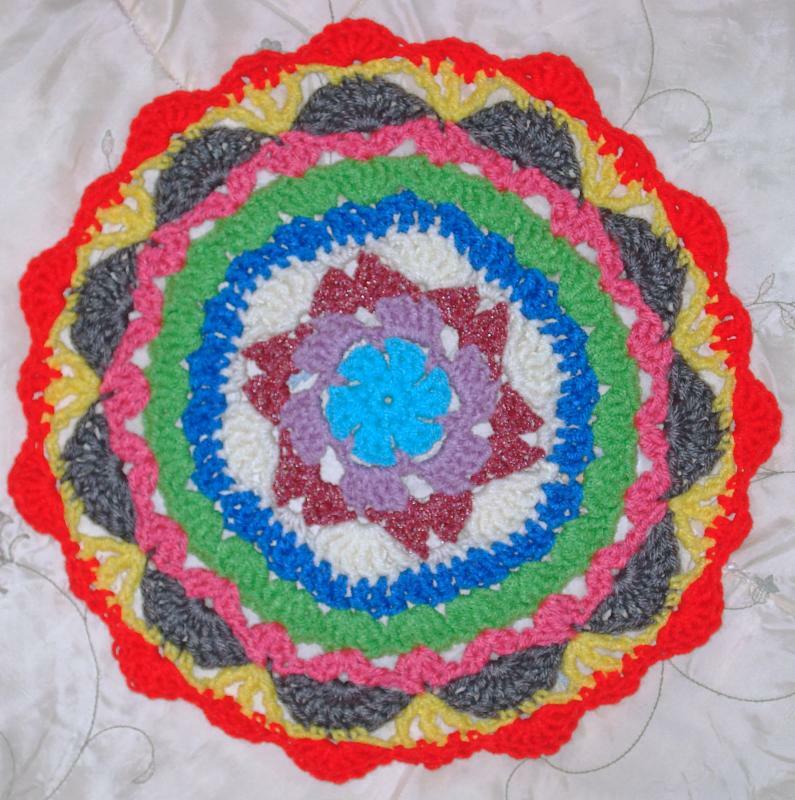 It looks pretty good to me, I cannot post pictures as I cannot connect to crochetville from my home computer. I feel like I am cheating in these games as the project was a small one. But It was a challenge for me and I did finish. 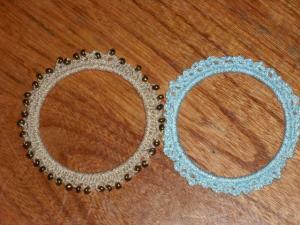 Now I am working on Infinity scarves made from lace weight Alpaca yarn (really not any bigger than thread!) I am about 90% done with the first one. I plan to make at least five of these although not in time for it to be part of the Olympic games. 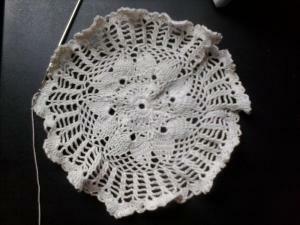 I've just finished round 19 of my doily. There are 30 rounds total, so it's coming along! My fingers will be happy when it's done. lol I'm going to start round 20 later today. Really happy with the progress I have made to this point! ratdog: I'm really bummed you can't post pics... I love looking at thread work since I don't do it... Congratulations on finishing your project!! That has to feel like an accomplishment! 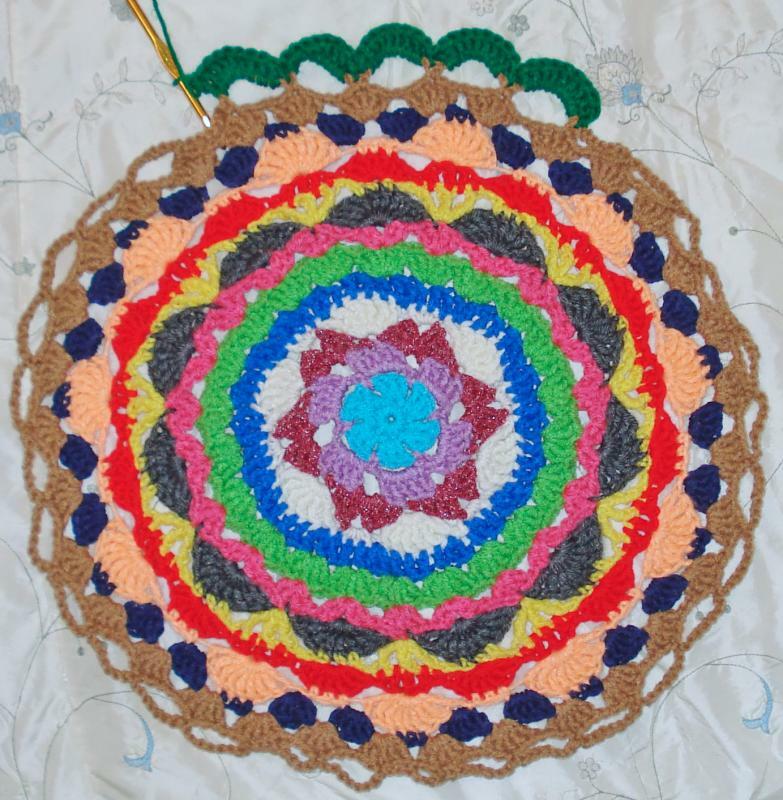 Gingerbread Girl: Your doily is coming along nicely, and it's so beautiful! I suppose if I just made myself get used to the difference in working with thread as opposed to yarn I *might* be able to do something like that, but since I'm not planning to do that anytime soon I just have to drool over (not onto - I mean, YUCK!) the lovely work of others... Thanks for posting a picture!! I haven't been feeling the greatest the last few days, so haven't made much progress on the vest I'm making. I did get two rounds done since I posted the pictures, so I am working on it - it's just not getting the majority of my attention right now. Illness began with my daughter last Thursday so I was taking care of her, then myself, then my son, and also now my hubby. It's nothing horrible, just uncomfortable and annoying mostly. LOL After I finished the round I did last night, I needed something boring so I pulled out a spiderman round ripple I'm making for my goddaughter and put a little over a round on that... so I felt somewhat accomplished. I hope everyone else is finding the time to work on their projects and enjoying the friendly competition of the Games! !